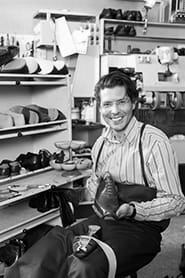 Shoemakers, leather repairers construct, decorate or repair leather and leather-like products, such as shoes, belts and bags. Confer with customers to obtain relevant information, e.g. their requirements, and to give them advice. Calculate the costs of requested products or services such as custom footwear or footwear repair, and receive payment from customers. Select materials (e.g. leather or fabric), and choose or prepare patterns. Position or outline patterns onto materials, and cut out parts, e.g. using knives, shears, scissors, and machine presses. Treat leather or other materials to obtain desired effects, decorations or shapes, using various techniques such as dyeing, painting, stamping, stitching, staining or punching holes. Join parts, e.g. by aligning and stitching or glueing materials. Attach insoles to shoe lasts, affix shoe uppers, and apply heels and outsoles. Position and secure linings, and attach accessories, e.g. buckles and eyelets. Finish and clean the product, e.g. trim soles and heels to shape, check the product quality, and polish shoes. Repair footwear and other leather products, e.g. replace worn soles and heels, insoles or accessories (buckles, zips, straps, etc.) and renew stitching. Keep the work area tidy, and clean and maintain tools and machinery. Perform business-related tasks such as marketing, purchasing supplies and equipment, keeping financial records, etc.